UPDATE: ZenSleep is currently running a Buy One Get One free promotion through this link. If you snore, you are likely looking for the one product that will help you or your partner get a good night’s sleep. There are many companies on the market selling various snoring aids, including the ZenSleep Company. Based out of Scottsdale, Arizona, this small online seller specializes in various anti-snoring devices, including nasal vents, earplugs, and tongue restraining devices. This is a review of the ZenSleep’s tongue restraining device, the ZenGuard. 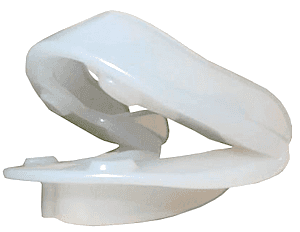 A tongue retaining device is not a snore guard that fits around the teeth, like SnoreRx, but is instead a device that keeps the tongue in place during sleep. Tongue restraining devices (TRDs) are designed to hold the tongue forward while sleeping to prevent the tongue from obstructing the airway. By keeping the tongue forward while sleeping, the TRD prevents the tongue from collapsing against the back of your throat. Decreased muscle tone in the back of the mouth is often the cause of tongue collapse. A tongue collapse often results in sleep disturbing snoring. TRDs have been shown to reduce mild to moderate symptoms in people who suffer from snoring due to a large tongue or large tonsils. There are many different types of TRDs on the market. The Good Morning Snore Solution is the best-selling version. The ZenSleep ZenGuard is a similar product to the Good Morning Snore Solution. 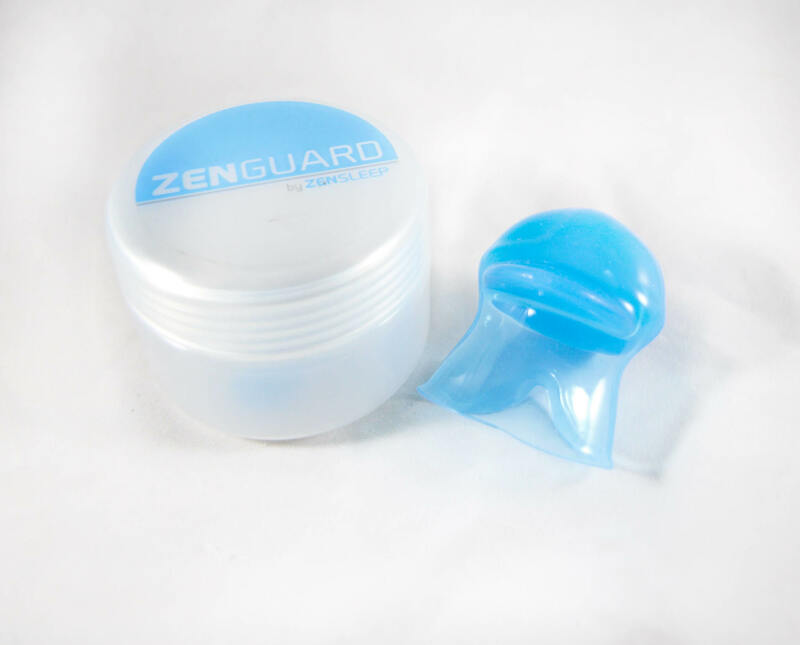 The ZenGuard is a silicone bulb designed to hold your tongue forward and prevent airway obstruction while sleeping. When you first receive the device, the manufacturer recommends rinsing the TRD under hot water with the V-notch facing down to help soften the medical silicone making it easier to slip the device on your tongue. After each use, rinse the TRD with clean hot water. Do not use mouthwash or any other chemical product as they will damage the medical silicone and void the warranty. To wear the device, push the tip of the tongue gently into the guard until it touches the sides of the device. Then, gently squeeze the bulb between the forefinger and thumb, which will create suction at the tip of the tongue. Use a gentle repeated pumping action to draw the tongue into the device. ZenSleep recommends you practice putting your tongue into the TRD to determine the proper amount of suction for your mouth. Too much suction will cause discomfort. Too little suction will cause the device to fall off during the night. To remove the device, press on the sides of the device to break suction and remove the tongue from the sleeve. Once you receive the product, do not use it the same night you receive it. Wear the TRD for 10 minutes at a time while watching TV or reading to find your comfortable fit. I ordered my ZenGuard online at their website. As a forewarning, their website is a bit aggressive with its sales tactics. I made sure I stuck with the product I was planning on buying and avoided picking up any other items. For instance, when I went to check out, they tried to upsell all kinds of sleep aid products I was not interested in. Additionally, while you can get expedited shipping, they will charge you for it and they will also try to sell you a $10 warranty on your ZenGuard. I did not purchase either of those. Out of the box, the ZenGuard is a large TRD with a big suction bulb at the end. It looks like a larger version of the Good Morning Snore Solution. I was excited to try out this TRD when it first arrived, but it was hard to figure out how to use it. The product does not come with instructions. Per the instructions on the website, I first tested the ZenGuard during the day for 10 minutes, but I could not place it in my mouth correctly. I started testing the ZenGuard at night a few days later. I finally figured out the protruding lip near the bulb of the device goes between your lips and gums. This holds it in place and keeps it from falling out of your mouth at night. My wife had a good laugh seeing me wearing a pacifier looking device before going to sleep! If you’re looking for romance at night, you won’t get it with this appliance. Despite practicing wearing the Zensleep ZenGuard for a few days prior to using it at night, it took me several hours to get used to wearing this device at night. The suction on the bulb is unyielding and I experienced a lot of tongue soreness, even after just a few minutes of wearing the TRD. The tongue pain made it difficult to sleep. I did try wearing the ZenGuard for several nights and had the same experience each time. I never adjusted to wearing it. As a result, I was unable to get a good enough reading with my snoring app on my phone to test if the TRD reduced my snoring. My overall takeaway with this product is there is an extended adjustment period. I would guess that several weeks of practice are necessary. Test it out for an hour the first night, and increase it to 2 hours the 2nd – 5th nights. Over a few weeks, your tongue and mouth and brain will get used to having it in every night. This product takes a lot of dedication. Cheaper Alternative to the Good Morning Snore Solution. The ZenGuard is less expensive than the GoodNight Snore, so if you have had success with the Good Morning Snore Solution, you might find this to be a cheaper alternative. Discomfort. Until you’ve adjusted to the feel of the ZenGuard, this TRD causes tongue soreness, which will result in reduced sleep. Also, you may develop canker sores in your mouth which will delay success. Aggressive sales tactics. You must be diligent in avoiding and/or ignoring the aggressive sales tactics on their website. Increased Salivation. Many TRDs cause a temporary increase in salivation while the brain and mouth adjust to the device. Most people who use the ZenGuard report increased salivation that disappears within a few weeks of use. The ZenGuard can work for you if you have a large mouth or tongue. If you have had success with the Good Morning Snore Solution product, this is a cheaper version. You should expect to have an adjustment period to become accustomed to the suction strength.